So tell me—what do the opening of the Suez Canal, a dearth of good subjects for serious opera, a stage-struck Egyptologist, the Franco-Prussian War, a generously spirited diva, the manuscript for a children's book, a famous mouse-logoed entertainment corporation, a legendary rock composer, and a renowned musical theater lyricist have in common? Simple—they are all part of the story of how the show we offer for you tonight—Elton John and Tim Rice's AIDA—came into being. Our story began, not in some ancient legend from the land of the Nile, but in a more recent past. In 1869, the famous Italian opera composer Guiseppi Verdi was approached by the largely French-financed directors of the about-to-be-opened Suez Canal to write an inaugural hymn for their kick-off festivities; Verdi refused, thinking the project would distract him from the serious business of finding worthy subjects for his next grand opera. The Italian genius was a very picky man when it came to quality plots for his projects, however, and so about a year later he still had no good idea for a new opera. At this point a friend of Verdi's sent him a sort of scenario for an opera penned by an opera-loving archeologist and Egyptologist, Auguste Mariette. The newly-invented tragic love story that Mariette outlined for Verdi was set amid the monuments and conflicts of Ancient Egypt, and Verdi jumped at the chance to work on an epic scale. Verdi wanted to premiere the new opera in Paris, but in 1870-71 France was at war and the invading Prussian-led armies of a rapidly unifying German Empire endangered Paris. With delays and casting difficulties mounting, Verdi and his collaborators agreed to open the new work at the new Cairo opera house on Christmas Eve 1871. Aida was a smash hit, and after triumphant performances in all the major European and American opera houses, the piece became a staple of the international opera repertoire. Here's where the story takes an interesting turn. In the last decade of the 20th century the fabulously talented opera diva Leontyne Price, who had a passion for opera education for young people, wrote a kids' storybook version of Verdi 's opera. Predictably enough, the equally fabulous family entertainment corporation, Disney, already deeply committed to a highly successful string of feature-length animated musical renderings of classic tales, bought the rights to Price's book, intending to make another film in the style of The Lion King or Beauty and the Beast. The cartoon version didn't get off the ground, but since Disney had been experiencing enormous profitability by developing stage versions of its animated musicals, the project was reconfigured into a stage musical. 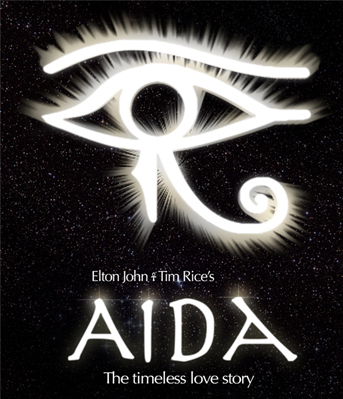 Elton John and Tim Rice joined the creative team as composer and lyricist, and the new musical had its first staging in Atlanta, Georgia in 1998 under the title Elaborate Lives: The Legend of Aida. Rewrites and additions brought the show to Chicago in 1999, where a stage accident nearly ended the careers of the show's stars, Heather Headly and Adam Pascal, when the "tomb" set in which they were singing the show's finale—suspended eight feet over the stage—broke loose and crashed to the deck. Despite this ironically appropriate ill omen, the show went on to NYC and a run of 1, 852 performances. 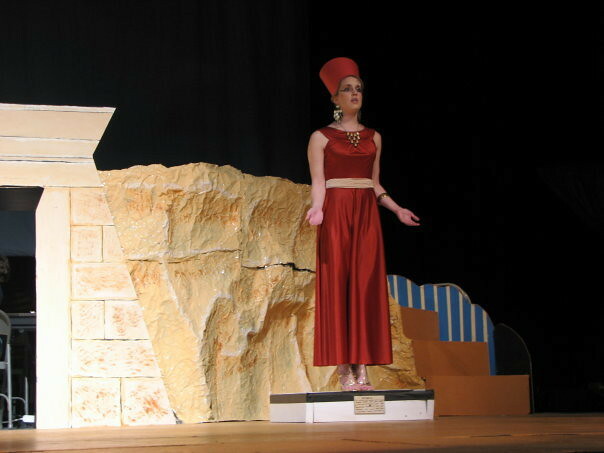 As the show was in this cross-country developmental journey, songs were cut and replaced by others, scenes were retooled, and a highly stylized hybrid "look" for the show's visual elements replaced its original, more historically accurate ancient Egyptian sets. Elton John's score took on an ever-more-eclectic sound, with influences as varied as American Gospel, Motown, Afro-Caribbean, Indian, and Middle Eastern mixing in intriguing ways, reminiscent of his earlier work on the score for The Lion King. The plot of the Verdi/Mariette story was also changed and simplified to put more emphasis on our 21st century preoccupation with clashes between cultures and the tendency of Western nations to regard the rest of the world as "undiscovered" until we explore/invade it. At its heart, though, the Elton John/Tim Rice version of this great tale of a romantic triangle that rocks empires is one that can stand for the way that true love must contend against all barriers of race, nationality, ethnicity, class, and even family when those loyalties threaten our common humanity. Director Sean Deffley and the nearly 60 students who have sacrificed their time and talent to bring AIDA to LVC believe in its message. They've learned a whole new theatrical style, surmounted limitations of financing, equipment, rehearsal space, and even weather, in order to demonstrate their conviction that this 75+ year old student organization is an ideal place to practice the College's mission to integrate everything they've learned in the liberal arts into a model for living, working, and sharing with others that we can all be proud of. Enjoy the show.